Enjoy luxury apartment living, superior service and the best location in Houston at Camden Plaza. Our pet-friendly studio, one and two bedroom apartment homes are perfectly located in the popular Upper Kirby neighborhood. With direct access to US 59 and 610 Loop – you can get to all the city’s top destinations in minutes, including the Galleria and Uptown. Named "Houston's #1 best apartment option" by the Houston Chronicle and #3 in the 2016 Elite 1% ranking of properties for online reputation in the nation, our customer service and established reputation are unrivaled. Enjoy being a pedestrian with a coffee house, sushi restaurant, movie theater and hair and nail salon all within walking distance! We’re also just a few steps away from the Greenway Plaza business district. Forget wasting your life stuck in traffic and have more time for what’s important – living! Entertain your neighbors and friends from the comforts of your own home by utilizing the social lounge complete with a fireplace and plenty of comfortable furniture on the first floor and catering kitchen, billiards, and poker tables on the second level. Or go for a swim in one of the two resort-style pools with water features, sundecks, and WiFi. Feel like a workout? Our fitness center is open 24-hours and includes a yoga/spin room, along with plenty of cardio equipment and free weights. Our business center offers the perfect space to study or enjoy a cup of coffee with friends, and the adjoining club room has plenty of space to relax and entertain. 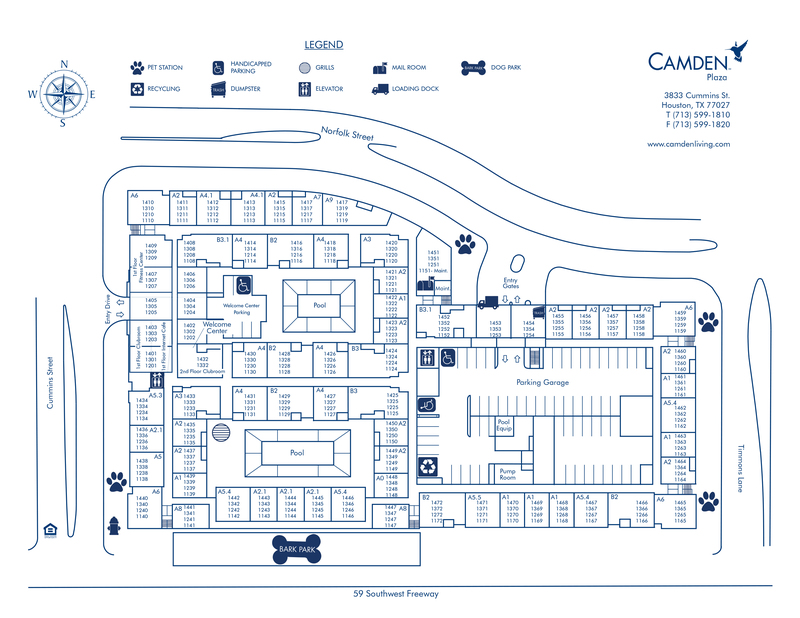 Camden Plaza is a pet-friendly midrise apartment community and offers a one-of-a-kind private dog park with an agility course. Each Upper Kirby apartment feels like a luxury home with features like stainless appliances, engineered wood or polished concrete flooring, 10-foot ceilings, granite countertops and luxurious garden tubs. Select apartment homes include built-in bookshelves with desks, walk-in showers, and floor-to-ceiling windows. Other conveniences include valet dry cleaning, at-your-door trash pickup, and recycling, as well as direct access parking. Residents receive a technology package included in their total monthly rent with a savings of up to 55% off retail. This money-saving package includes high-speed internet up to 150 Mbps and over 140 digital video channels including HBO through Xfinity. Use the Xfinity Go app on your smartphone or tablet to access your digital video anywhere! No matter where you’re from, come home to Camden Plaza. It’s time to start living in one of the 10 best-rated apartment communities in Houston. We have ample, open parking in our 6 level, direct access parking garage for our residents and a designated area for visitors on a first-come, first-served basis.